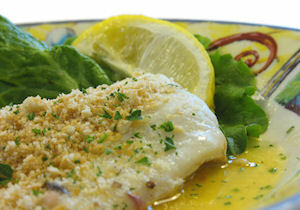 Place the haddock fillet into a pan and cover it with milk until the milk reaches about 1cm above the fish. Cook the fish on a low heat for about 10 minutes or until flaking. Remove from the milk and discard the cooking liquid. Finely chop the parsley and the onion. Cut the hardboiled eggs into quarters and place them to one side. Heat a little bit of oil in a large frying pan. Add the rice and toast it in the oil, cooking it for a couple of minutes. Add the chopped onion, the curry powder, garam masala and the coriander powder. Stir well and cook for a further 4-5 minutes. Add the water and then stir well. Bring the rice to a simmer and cook it for ten minutes. Add the peas, and then cover and simmer again for another ten minutes or until the rice has absorbed all of the water and is soft and tender. Flake the fish and fold it through the rice along with the chopped parsley, season the mixture well and garnish with the hardboiled eggs and a little more parsley.